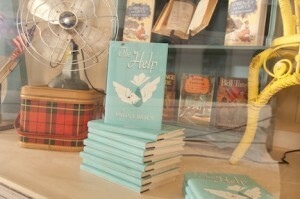 Pretty Southern readers, we have a rare glimpse into more than a dozen clips from the film “The Help”! Check it out here for videos and pictures. Here’s a bit of what you can see. We have Aibileen (Viola Davis) and Minny (Octavia Spencer) with their sweet scene at the end of the film after their characters worked so hard to write The Help. This is a fabulous film about courage, gumption and being brave enough to do the right thing no matter how hard it may seem. Together these women become the central voice to write the stories of the black maids working during the Civil Rights movement in Jackson, Miss. Part of the reason Aibileen is willing to help Skeeter Phelan (played by Emma Stone) is because they share the common thread of gumption. Here is an incredible scene of Skeeter and Minny at Aibileen’s kitchen table working on their stories together. Really all three women have the same dream: being happy, overcoming adversity, and serving a higher purpose than what their existence currently relegates them. For Skeeter, she dreams of becoming a writer. I could relate pretty well to Skeeter’s character. It’s part of why I loved “The Help” so much when the book first hit the shelves. A young journalist trying to make it in the South when society says a girl should be more concerned with finding a husband. Skeeter wants it all and is willing to work for her joy. The entire cast really worked well together as a female acting troupe. One of the best character performances was Sissy as Mrs. Holbrook. What an amazing casting of this role, and with a bit of old lady makeup, any scene with Spacek added a little something extra to “The Help”. Just wait for the scene with the “special pie” Minny made for Hilly Holbrook. 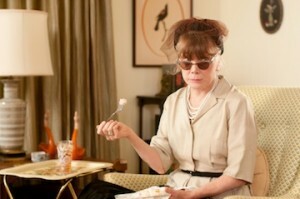 Sissy Spacek only makes this plot line even more hysterical. Speaking of hysterics, Jessica Chastain may be one of my new favorite actresses. Her performance as Mrs. Johnny Foote was enrapturing. In the book, it’s a bit hard to identify with Celia but her character in the film is absolutely charming. 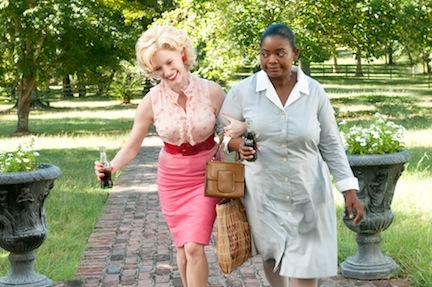 If you’re looking for some sweetness this week, head to your local cinema to see The Help and one of Pretty Southern’s Top 10 Southern Movies.